Tech giant Google announced its $3.2 billion purchase of Nest Labs, the wildly successful home automation company behind the Nest Learning Thermostat (read our review here) and the Nest Protect (Amazon.com link) smoke and carbon monoxide detector. Nest Labs, led by former Apple designer Tony Fadell, will continue to operate under its current leadership and retain its distinct brand identity. With the strength of Google behind it, Nest will stay at the forefront of the multi-billion dollar “connected home” industry. 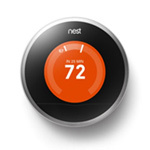 Google was already the subject of rumors that it was developing its own high-tech thermostat, and the search juggernaut was an early investor in Nest Labs, contributing to venture capital fundraising efforts in 2011 and 2012.